We live at a historic time. The 20th century was characterized by an enormous growth in energy consumption made possible by the discovery of large supplies of fossil fuels. Prior to 1850, almost all of the energy consumed by humans was in the form of biomass, largely in the form of wood, animal dung, or fats such as whale oil, beeswax, and tallow. While these sources were plentiful, the amount of labor required to obtain, process, and transport them was considerable. Furthermore, the utility of biomass was largely limited to combustion as a source of cooking fuel, space heat, and poor quality illumination. With the discovery of electricity and the advent of the fossil fuel era, humans’ access to energy changed dramatically (Vlachogianni and Valvanidis, 2013). Fossil fuels were much easier to obtain in large quantities, which made energy more affordable. Meanwhile, the development of transport pipelines and the electrical grid meant that energy could now be delivered directly to a consumer’s household or workplace, eliminating the time-consuming chore of fuel acquisition. The remarkable energy developments of the past century provided tremendous improvements in the quality of life for humankind, especially for those living in developed countries. Figure 1. 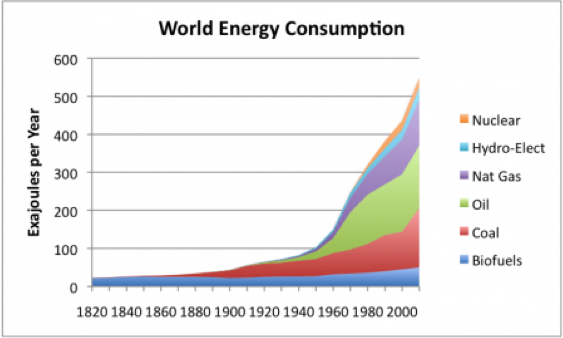 World energy consumption by source, 1820 to 2000. Based on Vaclav Smil estimates from “Energy Transitions: History, Requirements and Prospects”, together with BP Statistical Data for 1965 and subsequent years. (From Vlachogianni and Valvanidis, 2013). Electrical energy generation trends of the 21st century indicate a similar surge in the growth of clean renewable energy generation. As of 2015, global installed solar photovoltaic capacity exceeded 229 gigawatts (GW) (SPE, 2016), and installed wind capacity exceeded 433 GW (GWEC, 2016). 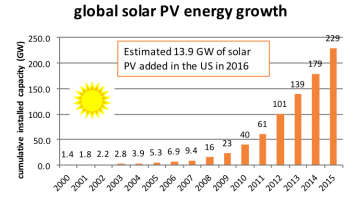 Including projects still under construction in the fourth quarter, it is estimated that the United States installed approximately 13.9 GW of new solar photovoltaics (SEIA, 2016) and 6.8 GW of new wind capacity (AWEA, 2016) in 2016. Even after accounting for capacity factors when the sun does not shine or the wind does not blow, these new renewable power production facilities installed in a single year provide the equivalent amount of electricity of several nuclear power plants. 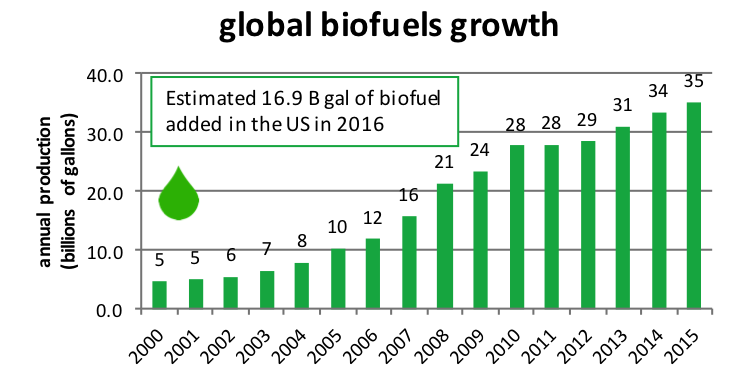 In addition, over the last 15 years, global production of liquid fuel from biomass resources has increased seven-fold to 35 billion gallons in 2015 (WBA, 2016). 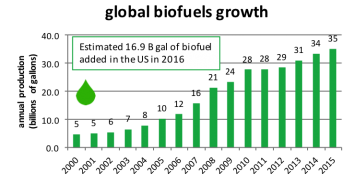 Nearly half of this fuel is produced in the United States in the form of ethanol and biodiesel, and domestic production is forecast to continue increasing through the year 2022 according to the Federal Renewable Fuels Standard. Figure 2a. 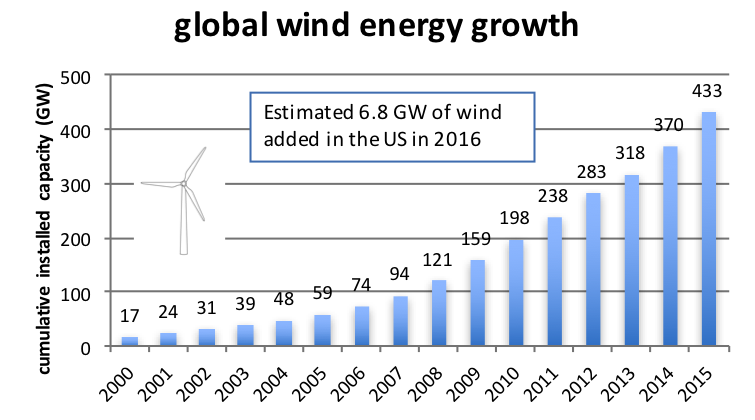 Growth in the global installed capacity of solar and wind generation. Figures drawn from data obtained from the Global Wind Energy Council (GWEC, 2016), and Solar Power Europe (SPE, 2016), and the World BioEnergy Association (WBA, 2016). Figure 2b. Growth in the global installed capacity of solar and wind generation. Figures drawn from data obtained from the Global Wind Energy Council (GWEC, 2016), and Solar Power Europe (SPE, 2016), and the World BioEnergy Association (WBA, 2016). Figure 2c. 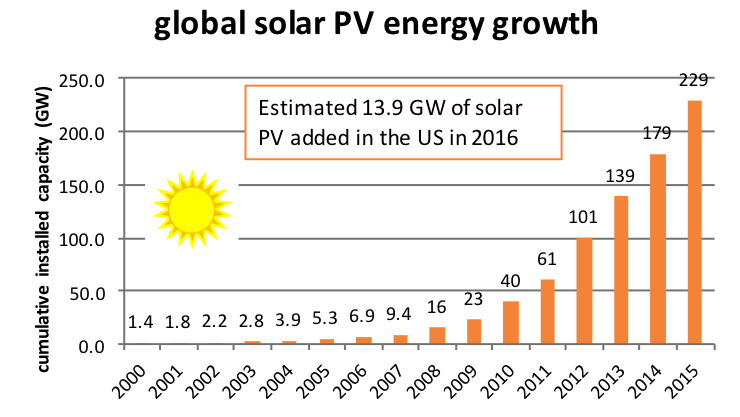 Growth in the global installed capacity of solar and wind generation. Figures drawn from data obtained from the Global Wind Energy Council (GWEC, 2016), and Solar Power Europe (SPE, 2016), and the World BioEnergy Association (WBA, 2016). Early adopters were critical to the development of renewable energy technologies in the latter years of the 20th century. Despite high costs, pioneering consumers created an entry market for the renewable energy industry to start, grow, innovate, and improve their products through engineering advances and increasing economies of scale. After the turn of the century, progressive initiatives put forward such as the German Energiewende, and the policies by states such as California, Texas, Iowa, and North Carolina created additional market incentives for the industry to increase in size, achieving utility scale production while facilitating interconnection and integration with the larger electrical grid. However, the recent exponential growth in renewable energy is not solely the result of sustainably-minded consumers making ethically motivated choices in their energy consumption. Today, the renewable energy sector is fueled by a combination of both sustainable decision making and favorable economics. As the renewable energy industry has grown, the cost of these technologies has declined dramatically. 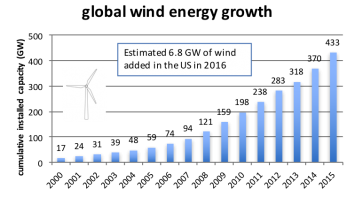 2016 saw new records set for both wind (Burger, 2015) and solar (Dipaola, 2016) power purchase agreements, with contracts signed for remarkable prices of less than 2.5 cents per kilowatt hour! These developments brought the costs of wind and solar down to the same favorable range as geothermal and hydroelectric power, and firmly established that when installed in favorable locations, renewable energy sources are now more affordable than wholesale power from fossil fuels. Recent analyses have shown that growth of the renewable energy industry over the past two decades repeatedly beat predictions by experts such as those at the International Energy Agency and the U.S. Energy Information Administration (Sussams et al, 2015 and REN21, 2016). Thus, to seize the opportunity to transition to a sustainable society powered by renewable energy, we must amplify our efforts to prepare the next generation. We must train a new generation of scientists, engineers, and technicians to implement renewable technologies on a greater scale and integrate these resources into our energy systems. The preparation of the future workforce is no small task. The wind energy industry employs more people than coal mining (De Place, 2009), and the solar industry employs more than oil and gas combined (Solar Foundation, 2016). The recent U.S. Energy and Employment Report conducted by the Department of Energy also found 104,600 people were employed in the biofuels industry, surpassing the number employed in the coal and nuclear fuel sectors combined (DOE, 2017). As of 2016, the renewable energy industry employs over 8 million people worldwide, and these numbers are certain to continue to grow in the future. (IRENA, 2016). Beginning in 2010, Madison Area Technical College (Madison College) launched an effort to provide training and professional development to educators in renewable energy technology. With funding from the National Science Foundation, this project delivered week long Renewable Energy Academies for community college and high school teachers, providing them with access to renewable energy equipment and empowering them with activities, lessons, and information to use with their students. A Biofuels Academy was developed by Madison College, which also serves as a training center for the National Alternative Fuel Training Consortium (NAFTC). Activities included production of biodiesel fuel using a fifty gallon pilot reactor; performing ASTM QA/QC tests on various fuels; comparing measurements of horsepower, torque, and emissions for an engine running on biofuel versus petroleum fuel; guest lecturers from industry experts; a tour of an operating biorefinery; and a teacher show-and-tell sharing session to highlight best practices in renewable energy education. In recent years, the Biofuel Academy has been hosted by colleges in Golden, CO, Lexington, KY, Greensboro, NC, and Shoreline, WA, to share the training with a broader geographic audience. Figure 3. 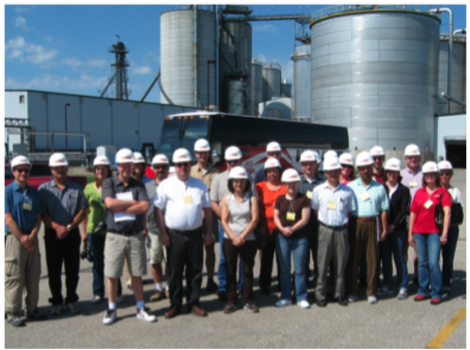 Teachers visit an ethanol refinery in the Biofuels Academy. A Solar Electric (Photovoltaics) Academy was developed in coordination with Solar Energy International (SEI). Content includes five-days of hands-on experience installing and working with solar photovoltaic (PV) systems. 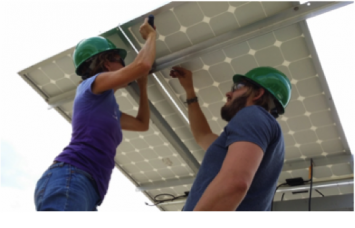 Participants learn to install, inspect, troubleshoot, repair, commission and de-commission multiple types of PV systems. The Academy emphasizes safe installation and commissioning procedures, and highlights techniques for teaching PV both in the field and in the classroom. The early work of the Academy also served as a model for professional development that was later replicated by the Solar Instructor Training Network, funded by the Department of Energy. Most recently, Madison College has built on these efforts to create a three-day professional development format designed specifically for high school STEM teachers. The STEM Solar Institute combines hands-on experience installing PV systems along with smaller bench scale activities that can be easily replicated in a high school setting. Lessons include measuring the open circuit voltage and the short circuit current of a solar panel, solar site assessment using a Solar Pathfinder, determining the maximum power output of a solar module, and solar performance modeling using the online tool PV Watts created by the National Renewable Energy Laboratory. The STEM Solar Institute was piloted in 2015 and 2016 in Madison, WI, and future institutes are currently being planned in Washington (2017), Colorado (2018) and Maine (2018). A pilot program for a Wind Energy Academy was also developed involving seven community college faculty and staff, and a small number of industry technicians from Wisconsin and Illinois. The participants were involved in the installation of a 1 kW wind turbine on a tilt-up tower, and a larger 10 kW turbine on a lattice tower. Each of the installations happened over a period of three days, and included an emphasis on workplace, winch, and crane safety, along with hands-on experience in wind turbine and tower assembly. Although these pilots have yet to be fully replicated with a larger group of teachers, they formed the basis for a new undergraduate course in Wind Turbine Installation that is now offered at Madison College. Figure 4. Participants in the STEM Solar Institute work on a pole mounted photovoltaic system. In six years, the Renewable Energy Academies reached a total of 284 high school and community college instructors, who teach in programs such as electrical technology, construction trades, industrial maintenance, engineering technology, and applied science. Teachers from 41 U.S. states and territories participated in the program as shown in the map below. The group included 70 women and 214 men. Given the gender disparity of faculty in the aforementioned fields, this is an exemplary result, and is important to encouraging women to enter the renewable energy industry. Figure 5. 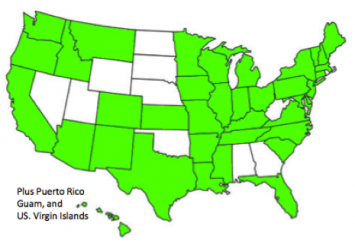 Teachers from the states and territories highlighted in green participated in the Renewable Energy Academies. The results of the Renewable Energy Academies were impressive. 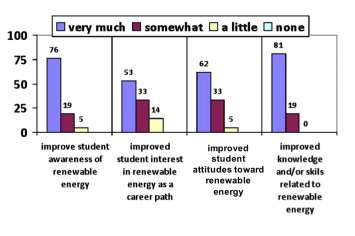 On evaluations, 96% of the participants indicated that their interest in renewable energy increased as a result of the Academy. 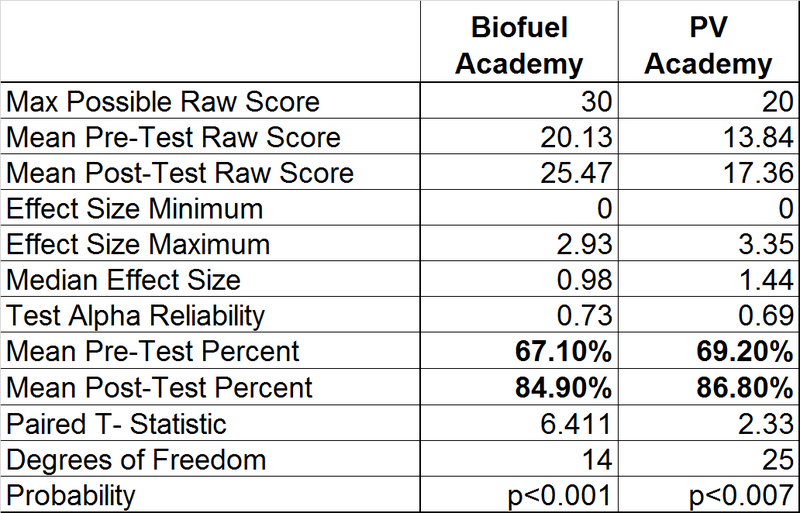 Pre- and post-test scores also indicated statistically significant increases in content knowledge for Renewable Energy Academy participants (See Table 1). Because Academy content and assessment tools were modified each year to account for technology advances and changes in industry standards and practices, the pre- and post-test scores could not be aggregated across years. However, the data shown are illustrative of the overall trend in participant learning gains. The Pre- and post- test results were consistent with participants self-assessed knowledge gains, which reflected that the Academy participants were actively aware of their own learning. Table 1. 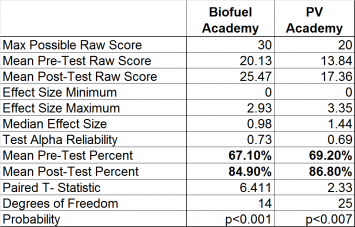 Pre- and Post- Test Scores for 2015 Renewable Energy Academy Participants. Figure 6. Participants self-assessed pre- and post- Academy renewable energy content knowledge, expressed on a scale from 1 (Nothing) to 5 (A Lot). 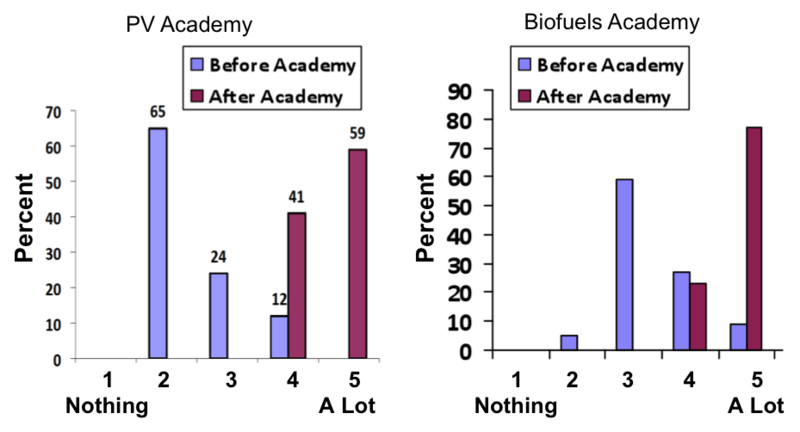 In 2016, a follow-up survey was administered to previous Academy participants to assess the long-term impacts on curriculum and instruction. 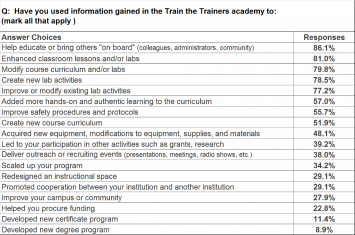 A large majority of Academy alumni used what they learned to help educate or bring others “on board” (such as colleagues, administrators, and community members), to enhance classroom lessons, to modify course curriculum, to create new lab activities, and to improve or modify existing lab activities (See Table 2). Over half of the teachers created new courses, added more hands-on learning to the curriculum, and acquired new renewable energy equipment, supplies, and materials for teaching their students. One third of the respondents reported they had improved safety procedures and protocols, and had scaled up their program to increase the number of students exposed to renewable energy education. As of 2016, over 35,000 students have been taught by the Renewable Energy Academy participants, and approximately 28,000 received direct instruction using the content and/or pedagogy learned in the academies. 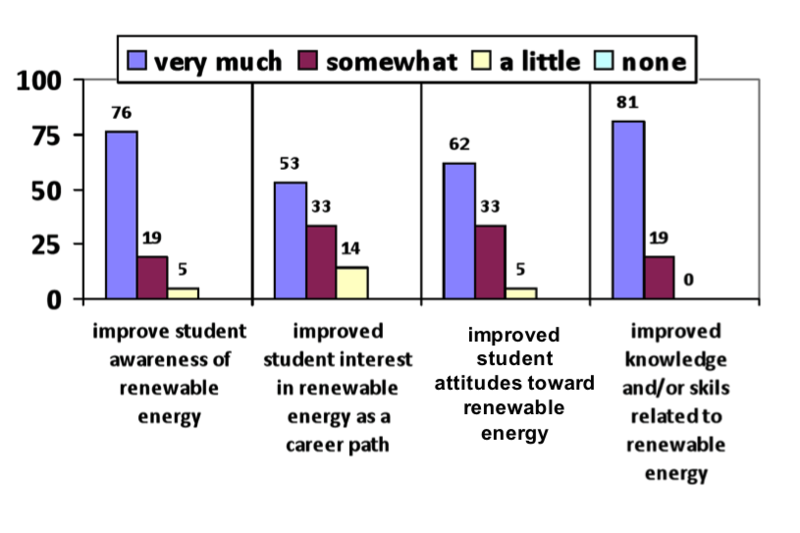 A majority of these teachers reported large increases in their students’ awareness, interest, attitudes, and knowledge of renewable energy (see Figure 7). The teachers who participated in the Academies will likely remain in their positions for many years, and thus the numbers of students that they teach about renewable energy will continue to grow. Table 2. 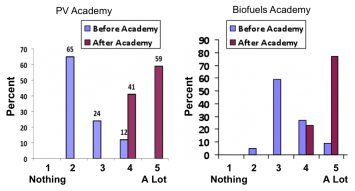 Data from the survey assessing the impacts of the Renewable Energy Academies on the professional practices of participants and changes to curriculum and instruction. Figure 7. 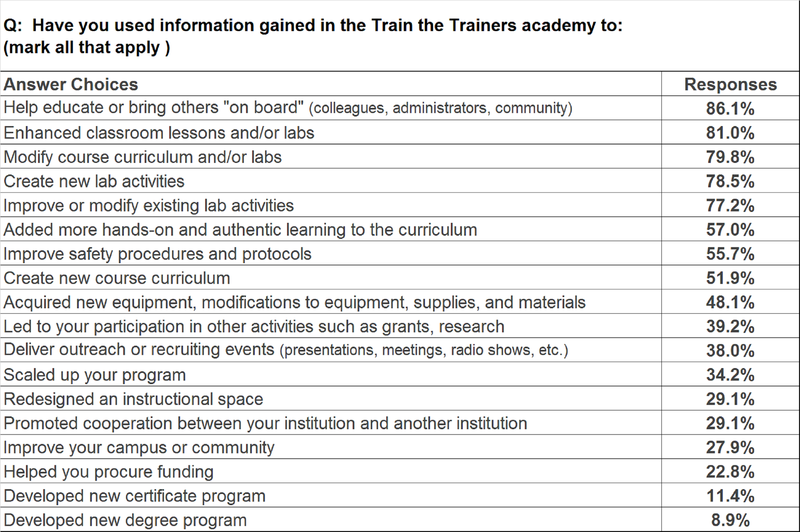 Percent of Train the Trainer participants reporting changes in their students. While we are pleased with the results of the Renewable Energy Academies, we also realize that work remains to be done. In 2016 Madison College partnered with College of the Canyons and Lane Community College to form the Center for Renewable Energy Advanced Technological Education (CREATE). With funding from the National Science Foundation, the Center’s goal is to advance renewable energy educational programs nationwide by serving as a source of teacher support, business and industry networking, professional development, and of educational materials. CREATE will continue to offer summer professional development workshops, along with webinars and a biannual newsletter for teachers interested in the subjects of renewable energy and energy efficiency. 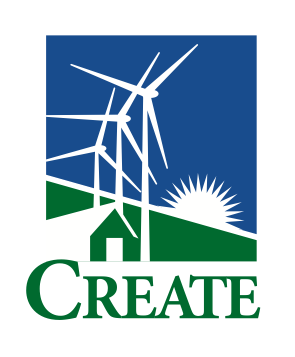 We encourage teachers to check out CREATE’s new website at www.CreateEnergy.org. On the website, teachers can subscribe to the CREATE email list, and can find additional details and application information for the CREATE professional development workshops. The remarkable growth of the renewable energy industry has exceeded the expectations of even the most enthusiastic sustainable energy proponents. If the past two decades are to serve as a guide, it seems clear that the future of renewable energy is both bright and prosperous. It is no longer difficult to envision a world that is powered in large part by renewable resources such as the sun, wind, biomass, hydropower, and geothermal energy. Sustainability advocates and educators are well poised to make that world a reality much sooner than later, and at CREATE we look forward to training the next generation of renewable energy professionals. This material is based upon work supported by the National Science Foundation under grants #0903292, #1205015 and #1600934. Barbara Anderegg, Paul Morschauser, and David Shonkwiler were key contributors facilitating the successful execution of the first two of these grant awards, while Cris Folk, Roger Ebbage, Kathy Alfano and Gabie Temple are essential team members for the latter. The faculty professional development programs described in this manuscript were developed and delivered with the assistance of Solar Energy International and the National Alternative Fuels Training Consortium. Deborah Davis at Bluegrass Community College, Matthew Brown at Warren Occupational Technical Center, Rick Lewis at James Dudley High School and Louise Petruzella at Shoreline Community College, were invaluable hosts who organized and facilitated renewable energy academies held in Lexington, KY, Denver, CO, Greensboro, NC, and Seattle, WA. Dr. Penny and Chuck Billman of REGS Consulting provided data gathering and analysis to assess the impact of this work, and additional evaluation insights have been provided by Dr. Jean Sando. Thanks also to the faculty members whose work is profiled in this report. Their efforts to teach the next generation of renewable energy consumers and professionals are an inspiration for us all.